It’s time for Michele Bachmann to go. For the last two years, I’ve been cautioning about the dangers of individuals or organizations trying to present themselves as leaders of the Tea Party movement. An individual personality or organization purporting to be a “leader” of what is truly a grassroots movement can hurt the tea party brand by creating false impressions about its core beliefs. Bachmann, the leader of the so-called tea party caucus in the House and the most vocal about her affiliation with the Tea Party than any other Presidential candidate, has consistently presented herself as a champion of the movement and its values. Bachmann has ridden her tea party credentials from obscurity to a national platform like no other. “I think it’s pretty obvious that Michele Bachmann is about Michele Bachmann,” American Majority Executive Director Matt Robbins said. “Anyone who knows the congresswoman, and knows her record, we appreciate a national figure standing up for the tea party types,” Robbins added. Robbins said the statement is not about the group favoring one candidate over Bachmann. Despite all my other disagreements, I do agree with this last line from Robbins. Medical marijuana advocates in California sued the federal government Thursday in an effort to quash a recent crackdown on the state’s storefront pot dispensaries, claiming government officials have overstepped their constitutional authority by not respecting how local officials have chosen to regulate pot stores and growers. The lawsuit filed in San Francisco by the advocacy group Americans for Safe Access states that recent raids of licensed dispensaries and letters warning city officials they could be prosecuted for trying to regulate medical marijuana cultivation and sales constitute an illegal power grab under the 10th Amendment. The amendment awards to states legislative authority not explicitly reserved for the federal government. The suit names Attorney General Eric Holder and Melinda Haag, the U.S. attorney for Northern California, as defendants. Haag’s spokesman, Jack Gillund, declined to comment on the case. While I disagree with Holder’s actions, to be fair there is no doubt that the systems to provide medical marijuana are also used to allow for more widespread use of marijuana. However, it is hard to find any reasonable justification for outlawing marijuana, and prohibition does not work. The most reasonable response would be to discontinue these efforts and to seek the legalization of marijuana. The California Medical Association has recently called for the legalization of marijuana despite having questions regarding the benefits of medical marijuana. A recent Gallup poll showed fifty percent support the legalization of marijuana, with Republicans and conservatives being most likely to oppose this. JesusWeen is a non profit organization also known as JesusWin. We are focused on helping people live better lives through the knowledge of our Lord and Saviour Jesus Christ. 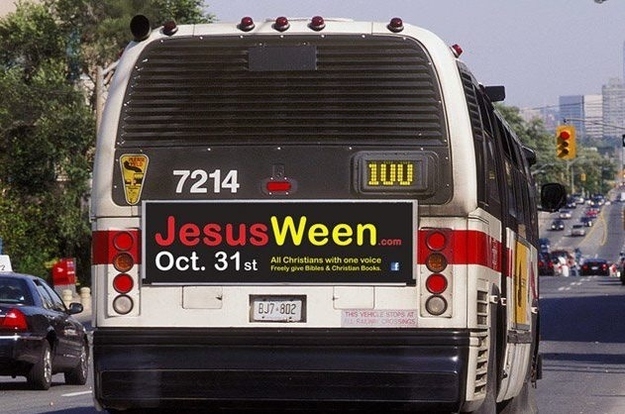 JesusWeen is a God-given vision which was born as an answer to the cry of many every October 31st. The dictionary meaning of Ween is to expect, believe or think. We therefore see October 31st as a day to expect a gift of salvation and re-think receiving Jesus. Every year, the world and its Every year, the world and its system have a day set aside (October 31st) to celebrate ungodly images and evil characters while Christians all over the world participate, hide or just stay quiet on Halloween day. Being a day that is widely acceptable to solicit and knock on doors, God inspired us to encourage Christians to use this day as an opportunity to spread the gospel. The days of hiding are over and we choose to take a stand for Jesus. “Evil prevails when good people do nothing”. JesusWeen is expected to become the most effective Christian outreach day ever and that is why we also call it” World Evangelism Day”. Buzzfeed has more links regarding JesusWeen.